How do you know when to end a pursuit? An officer who initiates a police pursuit accepts the responsibility to make another critical decision: when to end it. That may be made for him by circumstances or higher authority, but he still must constantly assess the risks of the pursuit with the potential reward of safely apprehending the offender. A pursuit that begins on a relatively deserted highway and remains in that environment relieves the officer from considering traffic density or congestion. Unfortunately, pursuits tend to traverse areas of varying traffic density. The chase that begins on a country road can move into the center of the city, or vice versa. An 80 MPH chase on an open freeway has a different dynamic than one on a city surface street. This represents a situation where the officer’s knowledge of the geographic area and the activities taking place in that area are critical. If it appears that the path is going to go by the local high school (and juvenile offenders have been known to drive by their school so their friends can see them running from the cops), knowing when students will be going to and from school is critical. The road might be clear for most of the day, but congested during the half hour immediately before and after school hours. The reasons an officer initiates a pursuit are important, but those reasons may change. The officer may have observed a minor traffic violation, tried to make a stop, and had the driver take off. His department policies might not justify a pursuit under those circumstances. However, what if he then learns the vehicle is stolen, or is wanted in connection with a violent crime? It may take a minute or so to get a return on a wants check for the license plate. Until that information is in hand, it may be permissible to allow the pursuit to continue. If the officer did not pursue, and later found he had someone on the Ten Most Wanted List in front of him, the department could be embarrassed. That situation can work in reverse, too. An officer might initiate a stop based on the description of a vehicle used in a crime, then find the wanted vehicle has already been located. If there aren’t any other justifications for the pursuit, it might be best to terminate the chase. 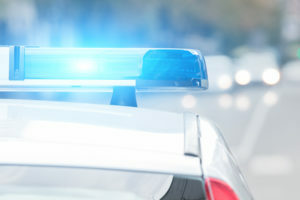 One of the hazards of a police pursuit occurs when either the suspect or one of the police vehicles causes an accident involving a third party. This might come from a direct collision between one of the vehicles in the pursuit or someone just trying to get out of the way. The fleeing suspect may be criminally responsible for the accident, even if there is no direct contact between his vehicle and one of those in the collision. Some states’ statutes attach culpability for any harm to third parties as a result of their attempts to elude police, kind of a variation on the felony murder rule. If this happens, a pursuit based on a low-level traffic offense may now involve felony hit-and-run, and needs to be evaluated in that light. If an officer witnessed a car blow through a red light and broadside another car coming through the intersection, and the violator then tried to flee, the officer would almost certainly be justified in engaging the pursuit. If this happens in the middle of another pursuit, the circumstances should be no different. Monitoring radio traffic during a pursuit is critical for the obvious reasons of updating location and direction of travel, but also for monitoring the officer involved. Calm, measured transmissions usually indicate that the officer is in control of his emotions and not getting caught up in the excitement. If the officer’s voice becomes loud and shrill, or if his speech is rushed or pressured, the “executive functions” of his brain may have taken a temporary holiday. Many agencies train their officers in “combat breathing,” where officers force themselves to take in air slowly and deeply, hold the breath for a second or two, and then let it out just as slowly before repeating as needed. This forces the officer to monitor his emotional state and keep control. Officers cue one another to do this by saying something like “Don’t forget to breathe.” Having that instruction come over the radio may remind the officer in the thick of it to maintain perspective. Those agencies fortunate enough to have aviation support have another option for prosecuting pursuits. Once an airborne officer has the fleeing vehicle under surveillance, it’s all but impossible for him to lose them. The airborne asset can keep the suspect vehicle under surveillance until it reaches its destination or it moves into an area where patrol units can box it in and give it nowhere to go. This tactic may require detailing two or three units, minimum, to keep a “loose tail” on the vehicle, remaining close enough for a quick response when the air support officer gives them to go-ahead. The suspect will, in most cases, believe the cops have given up and will slow to a reasonable speed within a minute or two. Police trainer and risk management expert Gordon Graham is fond of reminding us that most misconduct problems can be traced to poor supervision. It is critical that police supervisors maintain active control of pursuits from beginning to end, and make it known they are doing so. The officer in the lead should know that his supervisor is keeping a close watch on the events, and that if the supervisor orders him off the pursuit, he must do so immediately. One protocol is to call the termination of a pursuit with the location of the officer when he stopped the chase, along with the suspect vehicle’s last known speed and direction of travel. This ensures that the officer doesn’t acknowledge the order, then continue the pursuit covertly. Everyone must understand that when the sergeant gives the termination order, the pursuit is over. Pursuit policies often represent a disconnect between street officers and management. The officers want to go after the bad guys with everything they have, and management is interest in limiting liability. Policy needs to be trained and explained not only in terms of what, but also why. The rationale for every part of the policy should be as well understood as the policy itself. Further, every pursuit is a platform for in-service or roll call training. Discussing the pursuit in detail, explaining the reasons why each decision was made, and critiquing the incident without assigning blame or fault reinforces everyone’s understanding of the policy, and makes the next pursuit go more smoothly. Great Article that all LEo’s should read. are off duty, do they, in general, like to carry their own personal firearms? I’m training to become a cop right now and I also concealed carry. Many times the type/model of weapon carried by officers is directed by policy. So it may not be up to the officer him/herself. However, with that said most likely if the officer has the opportunity to select his/her off-duty weapon in most cases it would be personal weapon, one that is a small sized model than what the department issues for official duty.